Podcast 11: How to learn more about gamification and stay up-to-date? Welcome to this week’s question of gamification. My name is An Coppens. I’m your show host, and also the Chief Game Changer on Gamification Nation. And this week, we will be delving deeper into a question from one of our listeners. And the question I actually get asked on occasion. How can people get better and learn more about gamification? And closely linked to that? How can they stay up to date with all of the changes and all of the new stuff that’s coming out around learning around technology around HR tech? So I’ll give you my answer in a sort of chunks. First of all, thank you to Ylva Persson from Norrkoping in Sweden for asking the question. I think it’s very relevant to most people in the workplace. Very likely you have used gamification before. And this is the first thing to do is to learn to spot it spotted because, for most people, it’s not as obvious as for us that work in the field all the time. Spotting gamification are things like progression bars if you see it in a game, and then you see it in a work application, it’s probably a game mechanic. If, for example, emojis likes, dislikes or votes, those kinds of items, I can guarantee you they came originally from game thinking. And then were made relevant or found relevant in an HR process or learning process. So it’s no surprise that these things are entering. So the the way to to keep up to date about it is look at the big players in technology, and today’s big players, which actually be social media, but also still IBM, HP, Dell, a lot of the big names that you would have heard of, but also big companies that are making big product product, profits from technology, like an Amazon like an eBay, what are they using, that could potentially work in your work environment. And I’m thinking very much around usability, user-friendliness. A lot of the e-commerce stores have actually given us tools that make our learning and HR systems better. But also allow for recommendations allow for, let’s say, one, stop shopping, one-click shopping. So those kinds of things you’ve probably seen before on the likes of Amazon. And a lot of the technology would have been originally technology for marketing, as opposed to technology for even games or even technology for learning and HR. So staying up to date is keep an eye out about what these guys are doing. And if you’re buying online is use their systems and see what you like and dislike. mean, for me, for example, shopping on Amazon, I’m often buying books for my Kindle, or even physical books, if I actually buy like a book enough on Kindle, I will also order it in a physical copy. So I can reference it and write in it and make notes. So I still use the mixed reality version of everything. And I also listen to a lot of books on Audible. And often you have a deal where you can have it on Audible and Kindle together and you get a special deal for it for either or so whoever writes the books gets profited me three times. Or at least Amazon does if they don’t because the profits people make from books on Amazon are marginal. I know because I have some there. You know, there are little things we can learn from the big players that are out all around us. The other things I do in order to stay up to date obviously look at newsletters from older people. So I trained with, for example, Yukai Chou from the Octalysis framework, and I follow their prime system, a system that they designed a community for people. Occasionally I dive into it. I read books from Andrzej Marczewski, who used to work with us and also has a lot of great information in his blog. But his books are definitely a must read. The same with my friends Monica Cornetti, Marigo Raftopuoulos, Karl Kapp and others in the space. There’s so much being shared Professor game his podcast I find useful, especially for people in the educational space, because he interviews many people who are actually putting gamification to work for learning, either in companies or in education institutes, universities, classrooms, etc. So there are many people on the market that already write and speak about the different options. Then who do I follow for HR tech? Well, Josh Bersin is a given. I think anybody in HR doesn’t follow him has been sleeping under a rock a little bit. I also like the work from Tom Haak who works with the HR Institute. So there’s a number of people I follow. And then I also follow futurologists. Now futurologists, you have to find the ones you sort of resonate with. One that I followed, thanks to having seen them speak in real life for the organization, I worked for a while back, which actually you may know MTG. They invited Greg Leonard, who’s Swiss-based to speak to leaders about what’s happening in the broadcast industry, it was very relevant then. And he has a lot of really good, interesting material on future items. I also look out for the Davos Economic Forum summit, where you often have a lot of Twitter activity, a lot of interesting talks by people who are on the cutting edge of new technology or new events. So it may not necessarily be technology improvement, but it could just be useful new inspiration that’s out there. On occasion conferences, I find useful. And you have to pick the ones that you think are good and that resonate with you again. It’s about, you know, what is it that works for you? What is it that you need to know in this moment, for you to step up to your next level? My guess is that you are probably doing a lot of the good stuff already. And yes, there could be more that you could do. But take it one step at a time, even for companies and projects that come our way in the learning space. If we’re going to gamify a whole curriculum, we basically break it down first into, okay, what’s the most important what’s going to have the biggest impact. And often we start with a pilot project. So we’ll take one course, or one area of a system to gamify. And then we gradually phase in the other parts. It really depends on how the company works, obviously, and what their objective is to see how we work with someone. But that’s a good start. Keeping up to date is a continuous piece of work. The next big thing is maybe AI or artificial intelligence. Tomorrow, it could be something different last year it was VR and AR, or, you know, the mixed reality version of it. And I think they all have a place. But if it’s big hype, and it’s only a few people talking about it, and a lot of people scaremongering, so you have to jump the bandwagon or you missed the boat? Well, you know, I’m a bit more, I suppose, let’s say cynical, if nothing else, I would also say, take it one step at a time, find out, is it relevant for your people? is it relevant for your systems, and will actually help because a lot of the fancy new tech may not be useful short term. If we look at virtual reality, for example, a great system great tools, but not useful for every single piece of learning, very useful for any experience-based learning where you can get people to do it. But if all your users don’t have access to VR tools, then again, it’s not the most useful use of technology. So not the most useful investment. In my view, the same way augmented reality, scanning something and getting your video to play is great, you’re on the fly, and the scanning is done on a piece of equipment. But if you put this just willy nilly anywhere, it loses its use. And also I would question if that is the best way of doing it? Always question new technology, it may be great, but always question Is it right for me? Is it right for my company? Is it right for my users? Other ways of staying up to date, I use Twitter and a lot of other social media, such as LinkedIn. Every time algorithms change in social media networks, it makes it harder for me to find what I’m looking for. So searchable hashtags help me to find the relevant material. But then that, in turn, updates the algorithms subsequently and changes my feed LinkedIn, for example, I find extremely frustrating. If any of you work in instructional design, or learning or research, you know that if you’ve been working on a specific course, for a while, all your ads, all your algorithms everywhere will start to promote these kinds of things to you even if you like it or not. I’m always a bit, I suppose, miffed when it happens to me when my feed gets taken over, because I was working on a specific project, and I was looking for something relevant to us in a project. It may not be relevant to you. If you’re looking for courses. The great course that’s still alive, I believe, is on course Coursera Kevin Werbach. It includes all the basics of gamification. If you are looking for gamification to specific to recruitment and learning, we have some on our website, so check out Gamification Nation, and there are plenty of others. There are loads of people writing courses at this moment in time, check the outlines of them and check if they are relevant to you, again, put your critical lens on and work with those that resonate with you. Maybe not everybody will, and that’s okay. There are people that speak a different kind of language than and even disagree with some of my work. They will have an audience, they all have a place. A lot of my followers work in HR and learning. So that’s our focus. Join debates on online, whether it’s a community group on LinkedIn, or Facebook or anything like that, where you hear about industry advancements that are useful. I take part in a group called TLDC chat, which has 4 pm, UK and 5 pm Swedish time online cast every day. I believe it also runs at 8 am in some of the US east coast time zones. But basically, it’s a group aimed at chatting about where things are at in the learning space. Sometimes it’s sharing of information. Sometimes it’s an update by companies, sometimes it’s sharing techniques on how we’re doing things. I’ve spoken on here to talk about gamification. There’s other people speaking about things like x API and what that is. And if you don’t know what that is, do look it up hashtag x API. If you’re in learning is you ought to already know. There is lots and lots of great information in relevant places. I usually have a trend post every, every start of the year on my blog. And what we’re going to start doing is a trend webinar once a quarter. Look out for this one, it will be about gamification trends, HR trends, learning trends, they’re my core audiences. So it will be relevant to them. I would say in summary, books, read online, follow people that you resonate with, subscribe to their newsletters, and push them into one separate folder. So you don’t get distracted all of the time, and take some courses in the fields that you’re interested in. Some of them you can do cheap, as in free, because most of the massive online learning materials or MOOCs are often free on Coursera. Or on LinkedIn Learning, I forgot to mention Karl Kapp. He’s one of the guys I follow. I read most of his books, and I’ve done some of the courses he has on LinkedIn. So if you’re in the learning space, definitely a must, must do. But there are plenty of experts out there that have something to share. The key is find out, do they speak your language? Do you resonate with them, if you don’t delete move on, if you do follow and delve deeper, there is in my view, more than one way to do everything. Even gamification falls into that bracket. Some people like my flavours, some people prefer other people’s flavours, and that is okay, so you choose and find yours. And then you follow those that you can learn from and stretch you a little bit so that you keep adding to the next level of skills. I hope that helps and keep listening to a question of gamification, to get the latest and greatest of what we have to offer. And thank you for listening. If you’re liking what you’re hearing, do give us a few stars or the platform that you’re listening to. It helps us boost our rankings. We have ulterior motives if you’re wondering, and also if you have a question that you would like me to address, do ask me on my blog in the comments section, and we will deal with your question as it comes up and as it fits into our schedule. Thank you for listening and hope to meet you soon. Speak to you soon or hear from you soon. Thanks very much. The post Podcast 11: How to learn more about gamification and stay up-to-date? appeared first on Gamification Nation. Making an experience better than its current reality through technology is now being nicknamed as augmented. So effectively one could argue that adding gamification and artificial intelligence is part of creating an augmented business. For some time augmented reality or the transposing of a fictional interface onto reality is where it stopped for people. I guess it all depends on the definition of augmented reality and how you see that for your business. Personally I quite like the term of augmented business thanks to technology additions creating an improved or enhanced experience of reality. The post Building an augmented business appeared first on Gamification Nation. What should be in my book on gamification of learning? 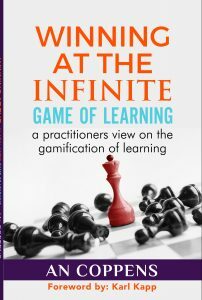 For those of you that have followed me for some time, you know I have been working on my next book titled “Winning at the infinite game of learning” – practitioners view on gamification. Karl Kapp has been so kind as to write a fore-word based on the outline given. Some people have even asked to buy it. And here is the truth, I am struggling to put the last 3 chapters to bed. I want this book to be representative both in quality and content of what I deliver week in week out for clients (no pressure there then). My not so positive self is questioning whether anyone really cares or wants to read what I think. My positive self is pushing on the other side, it must be your best work ever and a fabulous calling card. In between these two driving the writing has come to a grinding halt or at best stop/start. So because ultimately I want to write a book that people will read, I now want to reach out to you that are already reading my work online, what should be in this calling card. I am hoping that in my years of writing and speaking I may have shared something that mattered to you or even you implemented as a result, if you did then please get in touch with your story and with your permission I could include it. So please help me with the following: What based on what you know about me, do you want to learn from me? What do you feel I can share with you that will help you in learning related gamification? Here is the outline I have at this stage and yes I have content for the first 6-7 chapters more or less and can always revise some of it. Chapter 8: Success measure: what is the ultimate outcome? Chapter 9: Does gamification work? I would love to hear from you what is missing and what under even any of the above headings you would really love to know. Feel free to message me directly or write it in the comments below, even just a word of encouragement to help me get it across the line and into the editors would be helpful to me. The post What should be in my book on gamification of learning? appeared first on Gamification Nation. We often receive questions on how to kickstart engagement in a membership or learning community, in this podcast episode we give you advice on how we would approach this for clients. The post Podcast 10: How to create engagement in your community with gamification appeared first on Gamification Nation.